BowFlex BXE 116 Elliptical Review by Industry Experts! The BowFlex BXE 116 elliptical is a new machine from an already wildly-popular company. We recently spoke with Bowflex designers and they explained to us how they are working to offer their customers more options. You may know of this brand from their popular Treadclimber and Max Trainer infomercials. 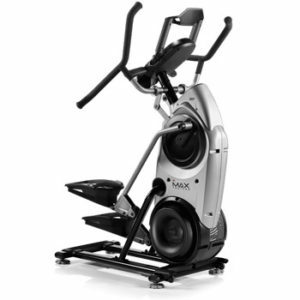 This BXE 116 elliptical offers a solid front drive elliptical design with an impressive 30 lb flywheel, 22″ stride length, and access to the Free Results Series fitness tracking app. Mid Week Sale Ends Thursday: Use the Promo Code on the Bowflex Website to SaveUse Code “TAX2019” for $99 Shipping on this Model! 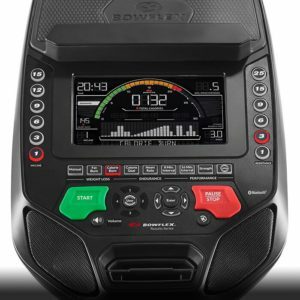 Bluetooth Compatible – The BXE116 is Bluetooth compatible so it can sync with the Free Results Series app from Bowflex. Input your goals, track your workouts, and make better progress towards your goals with this free system. 9 Pre-Programmed Workouts – This is a solid number of programs that can be viewed on the BXE 116’s 7.5″ LCD color display. Burn Rate Console – Watch your calorie burn ramp on this meter-like display. We like how clear and colorful the display is. It’s not as impressive as a full Color Touchscreen from some other brands, but the overall quality of the Bowflex machines makes up for it. 22″ Stride Length – This is a comfortable length for taller individuals. 30 lb Flywheel – This is a very heavy flywheel that will contribute to a smooth and natural feeling elliptical motion. Warranty – This is one area where we feel Bowflex still lags a bit behind the competition. They offer 15 yr frame, 5 yr parts and electronics, and 2 yr labor on the BXE 116. Check out a comparison chart of all Bowflex machines here. Bowflex Max Trainer M7 – Read our full review here. 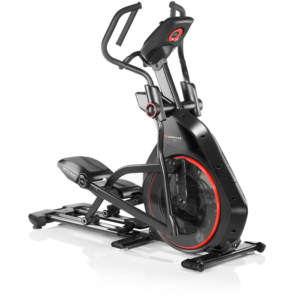 The Bowflex BXE 116 Elliptical is a solid machine from a great company. We’re not really sure it offers the same level of innovation that you will find on the Bowflex Treadclimbers and Max Trainers. Still, if you’re a fan of the brand, and want a great elliptical, this is a good option to consider. For around $300 more, you may also want to check out the BXE 216. It has a heavier 35 lb flywheel, a larger 9″ LCD screen, and a slightly different frame design.